Books have a special appeal to me–I like the look and touch of a good book. A few years ago, when presented an opportunity to spend several evenings inside the Stanford Green Library rare books room, I leapt at the chance and enrolled in a Continuing Studies seminar. The text for the workshop was a tiny gem of a book: Johann Gutenberg And His Bible: A Historical Study. The book is a concise history of the search for the printer who printed the oldest known Bible, now known as B42 (42 lines/page Bible). The task was difficult and took centuries to resolve—remember that, in early times, books left the printer unsigned, undated and unbound. The author of our text, Janet Ing, was a librarian at the Scheide Library in Princeton, NJ. The Sheide is an ideal place for a historical study of Gutenberg because it is one of 6 places in the world where the first four printed Bibles are together in conservation. One of these Bibles is B42 from the press at Gutenberg’s Printing Shop in Mainz, Germany. The small group of students filed into the Special Collections room in Stanford’ Green Library that evening to be instructed in incunabula—works in print from the 15 century or earlier—and our expectations were high that we would soon be seeing, perhaps touching, examples of these rare books and manuscripts. Most of us were carrying our copies of the textbook for the course, and, this being the typical class of overachieving adults, we had already read the textbook. We were a diverse class of students. There may have been a classics scholar among us—capable of reading the Vulgate Bible in Latin, the language used by Gutenberg to print the Bible. In 2002 the four historic Bibles were put on public display for a day in the lobby of the Firestone Library at Princeton University—what a monumental show that must have been for rare book fans. But, that show was “look/don’t touch” and here in the rare book room we were going to actually touch some of these rare incunabula. Johann Gutenberg was a job printer in Mainz, Germany. There was a living to be made in printing broadsides and pamphlets, but his vision was grander—he wanted to print a complete Bible on his job press. Money, however, was a problem. Quick turn-around printing had an inherent cash flow, but the Bible would take a year to produce. Gutenberg borrowed money, took on a partner, Johann Fust, and hired an assistant Peter Schöffer, who was Fust’s son-in-law. Composition of the text from written versions of Vulgate Bible of St. Jerome began around 1439. Italian paper was used for printing, as was vellum; costs began to mount. Ultimately the costs would prove the undoing of the Gutenberg Print Shop. Fust and his son-in-law would become owners via bankruptcy, but not until after the printing of B42 was completed. Look at the completed Gutenberg Bible (according to Wikipidia): each copy has 1,272 pages; with 4 pages per folio-sheet, 318 sheets of paper are required per copy. The 45 copies printed on vellum required 11,130 sheets. The 135 copies on paper required 49,290 sheets of paper. Copies left the Gutenberg workshop sewn into quires, unbound, without decoration, and for the most part without rubrication. Spaces were left for rubrication to be added by scribe hired by the purchaser. 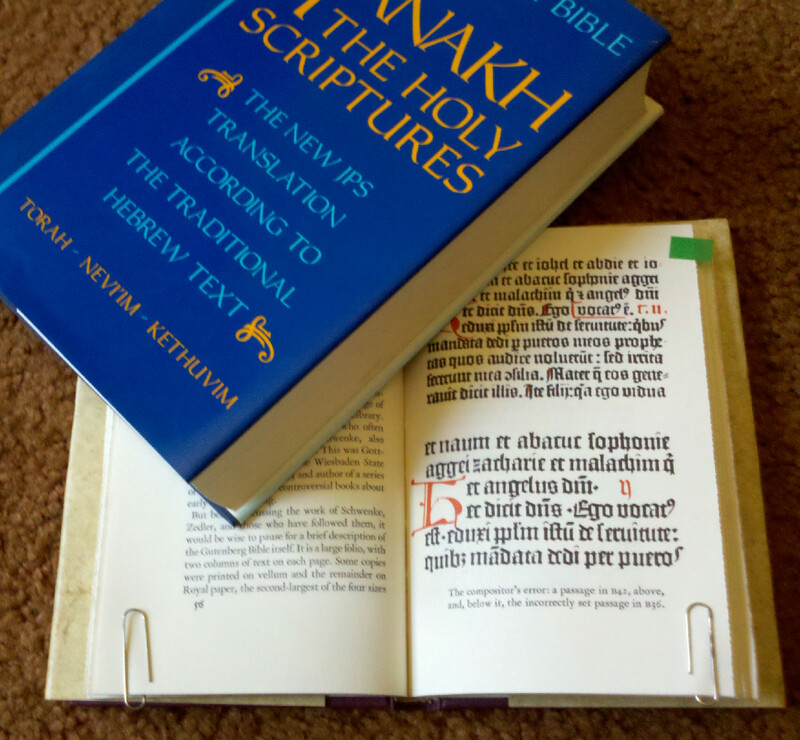 A guide of the text to be added to each page was printed for use by rubricators. In our first class, we were taught how to handle rare and sometimes fragile papers, and, after further cautions, we were issued white gloves, and several examples of incunabula were brought out. We were truly excited; the room was humming with emotion. It doesn’t get any better than this for a book fanatic. Our study continued for several classes. Each student had his or her favorite: mine was Euclid’s Elements, an example in English (printed after 1570) with foldout illustrations. Some of the incunabula we saw in class are now on display in the Green Library. I hope to visit them this weekend. It will be like visiting an old friend. The notice below will lead you to the exhibit; do go, if you can. Rare documents will be on display in the Stanford Green Library from August 1 through November 27, 2011. The show will be followed by a second exhibition, Monuments of Printing: from Caslon through the Book Arts Revival, which will be on display December 5, 2011 through March 18, 2012. Day 68: Johann Gutenberg And His Bible: A Historical Study, Janet Ing (1990). This entry was posted in History, Non-fiction, Translation and tagged postaweek2011, Stanford. Bookmark the permalink.